THREE top teams in Men's Premier League recorded solid wins with Boambee still leading after a 3-1 defeat of Coffs Coast Tigers. The home side put up plenty of fight and a classy strike by young Ethan Sechi was just the reply the Tigers were looking for after James Lowe opened the scoring for the Bombers. Shortly before half time Luke France scored from the spot after he was brought down in the box by keeper Luke Kleindienst to restore the Bombers' lead. Darby Sherrin's strike in the second half put the result beyond doubt. 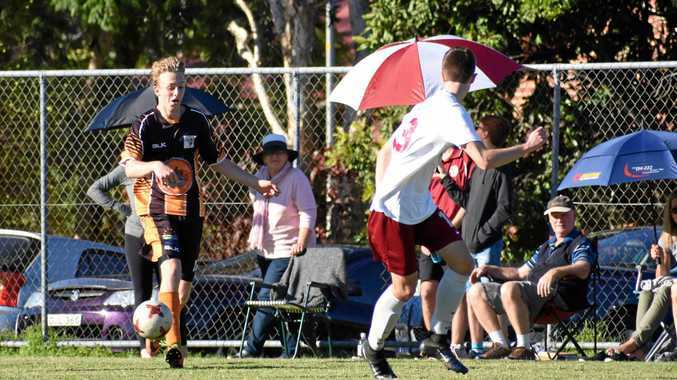 Coffs City United scored eight second half goals to defeat Westlawn Tigers 11-0. At half time Lions coach Glen Williams admitted he was less than happy despite leading by three. "I said to the guys at half time we're playing Urunga next week and we've got to stick to the game plan and lift," he said. Meanwhile, Boambee missed the knockout stages of the TAFE NSW Women's State Cup in Newcastle but can hold their heads high. Having finished third in their group, the Eagles went into the play-off match against Thornton Redbacks and began the brighter of the two with Kylie McDonald and Siobhan Deam creating chances. However, it took the Eagles until the second half to find the back of the net courtesy of Kathleen Vail in the 35th minute. The game looked destined for a Boambee victory until Redbacks player Alexandra Field unleashed a stunning long-range effort, sending the game into a shoot out won by the the southerners 5-4.